For months, Local 33, the Yale graduate student teacher’s union, had been calling upon the Yale administration to begin negotiating their first contract, a legal agreement between the union and the University about working conditions and employee benefits. In February, when graduate student teachers voted to unionize on a department-by-department basis, the mood among Local 33 organizers had been jubilant. But Yale had repeatedly refused to officially recognize the union, and by April, organizers decided it was time to raise the stakes. The sudden visibility of Local 33’s efforts this past spring took many undergraduates by surprise. 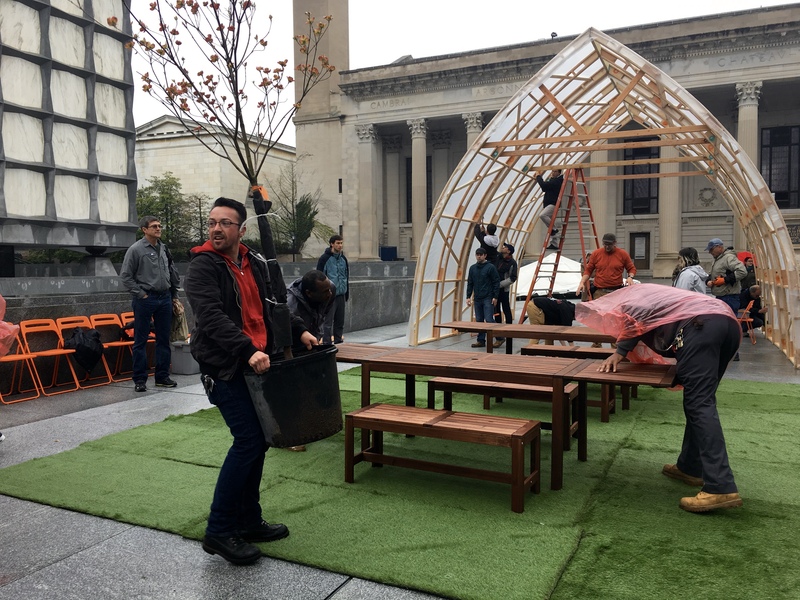 Most weren’t entirely sure of what to make of “33 Wall Street,” a 25-foot bowshed that members of Local 33 erected on Beinecke Plaza the morning after the Hillhouse Avenue march. The plastic-and-wood shelter stood for four weeks, staffed by round-the-clock shifts of supporters who gathered at picnic tables and under strings of lights. The encampment was impossible to miss and prompted passersby to confront the University’s relationship to labor — something many had never done before. But despite the seeming novelty of the demonstration, Local 33’s actions fit into a narrative of union organizing that is integral to the last half-century of Yale’s history. 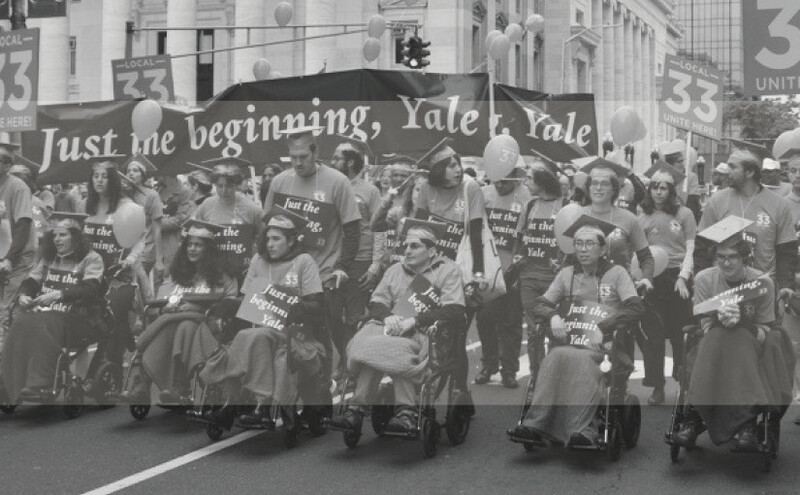 By the mid-1980s, Yale’s clerical and technical workers had formed Local 34, and its dining hall, custodial, and maintenance workers, who began organizing in the 1930s, had formed Local 35. Both unions currently exist under the international labor union UNITE HERE, which represents thousands of workers across North America, from hotel employees to railroad dining car workers. Motivated by rising job insecurity and the increasing cost of living in New Haven, graduate student teachers also started organizing in the late 1980s, first through a group called T.A. Solidarity, which later became the Graduate Employees and Students Organization (GESO) and, as of last year, Local 33. As each iteration of the group emerged, the Yale administration fought back, repeatedly thwarting their attempts to unionize. For the past three decades, the conflict between graduate student teachers and the University has centered on one central distinction: Are they employees, deserving of benefits similar to University professors? Or are they students, bestowed with University resources like undergrads, and tasked with extra responsibilities that reflect their academic training? Are they employees, deserving of benefits similar to University professors? Or are they students, bestowed with University resources like undergrads, and tasked with extra responsibilities that reflect their academic training? The graduate student teachers who began early organizing efforts in the late 1980s were fighting for not just for certain workplace conditions and benefits, but for a specific ideological framework: we are students and employees. It was an issue that had never come up for Yale’s dining hall or clerical workers, who were undoubtedly University employees. Doctoral students at Yale receive a full tuition waiver for five years of study, as well as teaching stipends, which vary from student to student. But for many graduate student teachers, that stipend, which is $30,250 a year at minimum — more than seven thousand dollars less than New Haven’s median household income — is not an adequate living wage. After years of demonstrations and debates that resulted in minimal progress, the graduate student teachers’ labor movement gained sudden momentum in August 2016, when the National Labor Relations Board ruled in favor of Columbia University’s graduate student teachers. The decision deemed them not only students but also employees entitled to collective bargaining rights under federal law. It provided the legal precedent for the battle that Yale’s graduate student teachers had been fighting for the past 25 years. But for Yale administrators, the ruling was not the final word. Shortly after the February elections, lawyers working on behalf of the University filed a “request for review” with the NLRB in Washington, D.C. The University wanted a reevaluation of Local 33’s “unprecedented” micro-bargaining strategy, which had been debated before the National Labor Relations Board in October 2016. Until the request for review was resolved, Yale would refrain from negotiations with the newly-certified union. Over the past three decades, Yale and its unions have maintained a fragile, often acrimonious, relationship. In a March 2003 article in The New York Times, Steven Greenhouse, a labor journalist, called it “unusually rancorous.” Until 2003, strikes and walkouts occurred almost every three years, as each contract developed through bitter negotiations. But this past spring, Local 33’s demonstrations seemed to belie any indication that the University and its unions were on good terms. At best, the protests recalled the bitter labor conflicts that have defined the University’s past. The striking clerical and technical workers were in the midst of their first contract negotiations in the fall of 1984. They called for salary increases, expanded benefits, and job security over the next three years. Dining halls closed as their workers, members of Local 35, joined the picket lines. Local 34 accused the University of discrimination on the basis of both race and gender; the union primarily consisted of the female support staff that populated the University’s reception rooms and front desks. When labor disputes dominated campus, undergrads were forced to reckon with their own dilemmas, both moral and practical, in ways that are unfamiliar to the vast majority of students today. The strike ended after ten weeks, although protests and demonstrations continued through the winter. When the University and the union finally struck a deal in January, Local 34’s victory was apparent. But it came with a price: a semester’s worth of lost wages and job uncertainty. When labor disputes dominated campus, undergrads were forced to reckon with their own dilemmas, both moral and practical, in ways that are unfamiliar to the vast majority of students today. Do I cross a picket line, or do I skip my class? Do I work my student job, or do I refuse in solidarity with the striking workers? Still, with its 80 percent female membership, Local 34 expanded people’s understanding of what a union member could look like and what unionization could achieve. Soon, graduate student teachers began to define themselves as workers with rights. The conceptual gap between an academic worker and an clerical worker was far narrower than the gap between an academic worker and, say, a factory worker. Additionally, many graduate student teachers were married to members of Local 34, exposing them to regular union activity, Wilkenson said. Practical concerns accompanied conceptual ones. In the 1980s, the teaching demands placed on graduate student teachers were growing increasingly intense. Graduate student teachers were asked to spend more time teaching undergrads than ever before. Financial strains were mounting: by the end of the decade, a graduate student teacher’s teaching salary was many thousand dollars less than the cost of living in New Haven. Financial strains were mounting: by the end of the decade, a graduate student teacher’s teaching salary was many thousand dollars less than the cost of living in New Haven. In 1987, a group of graduate student teachers calling themselves “T.A. Solidarity” — the precursor to GESO and Local 33 — held its first official meeting to discuss formal recourse for improving their working conditions. The organizers grappled with how to define their new group in relation to the unions that already existed on campus. As graduate student teacher Christopher Lowe jotted down on a legal pad during an early meeting, how could they maintain their autonomy as a graduate student teachers’ “advocacy group” while avoiding becoming a “union support group”? On the other hand, how could they learn from “the experience of the unions… about how Yale might behave?” As the graduate student teachers broached the question of tactics — to strike or not to strike? to withhold grades or to give everyone an “A”? — they balanced their own interests against public opinion and their allies’ positions. Lowe believed that a close alliance with the unions would help further both causes, and it was the position that the group’s organizers ultimately adopted. T.A. Solidarity’s evolution into GESO in 1990 marked the graduate student teachers’ first distinctive move toward a union-style advocacy group. Like a union, GESO went on strikes, petitioned the NLRB, and organized across departments. And in March 2016, GESO rebranded itself as “Local 33,” clearly signaling its allegiance to the union model. But the legal argument against graduate student teachers as workers held strong, as it had for years. Since 1970, cases regarding graduate teacher unionization at private universities had flooded the courts. In 1972, a ruling involving Adelphi University determined that graduate student teachers were “primarily” students, not employees. The pendulum swung back and forth over the next few decades, as decisions were reversed and reinstated, defining and redefining the nature of graduate student teacher work. With the Columbia University decision in 2016, the NLRB set a new precedent, arguing that graduate student teachers are legal employees. Local 33 organizers wasted little time to catch the momentum of fresh empowerment and launched into a new strategy for negotiating with the University: they would organize department by department. This strategy would secure collective bargaining units through individual departments — English, Geology and Geophysics, History, History of Art, Math, and Sociology — rather than through an all-department vote. Each of those six departments that voted to unionize would draw up a separate contract with the University. It was a tactic that ultimately included only a small proportion of the overall graduate student teacher body. But from Local 33’s perspective, they had achieved their union; they were NLRB-certified. “The logic of it makes sense, because people are doing very specific kinds of labors in very particular units,” said Jennifer Klein, a professor of labor history at Yale who supports and works with Local 33. “[White collar unions] are organizing through a different form of unionism than industrial unionism.” This “micro-bargaining” strategy made sense for Local 33 because of the highly-specialized nature of graduate-level work, she said, and because it was a more feasible organizing strategy for a place like Yale, where organizers expected considerable pushback. There was also some precedent for Local 33’s micro-bargaining tactic. In a 1996 academic journal article on the history of unionization at Yale, John Wilhelm, then-president of UNITE HERE, wrote that in the 1930s and 1940s, the custodial, maintenance, and dining hall workers organized “incrementally,” group-by-group, before banding into one union, Local 35. Their unionization process took over a decade. As 33 Wall Street stood on Beineicke Plaza, conversations on Cross Campus and in the comment threads of the “Overheard at Yale” Facebook page revealed the ambivalence over Local 33’s tactics that pervaded the student body. Why was so much of the graduate student teacher body excluded from the vote, as the University claimed? Were the elections really democratic? Why was so much of the graduate student teacher body excluded from the vote, as the University claimed? Were the elections really democratic? The University’s own delay tactics are similarly contested. Union detractors, including a sizeable portion of graduate student teachers, say Yale is a working within the bounds of the law; union supporters, including thirteen members of the Yale Law School who issued an open letter to the administration, believe that the University is actively defying labor law. In the purview of the past twenty years of labor history, the current situation could best be described as “business as usual.” Some legacies, it seems, are harder to shake than others. On the morning of last year’s Commencement Day, 33 Wall Street was unusually empty; the action was elsewhere. About five blocks away, in UNITE HERE’s downtown offices, local labor activists were preparing for a protest march that had brought hundreds of union supporters from across the East Coast to New Haven. Auto workers, fast food workers, union families, and graduate student teachers from other universities congregated on streets around the New Haven Green. “Union power in the ivory tower!” they chanted, sporting orange t-shirts and mortar boards. In the weeks leading up to commencement, graduating seniors and the University administration had voiced concerns that the protesters would disrupt the ceremonies by seizing the stage or blocking the path of the formal procession. But the action was orderly and celebratory. The demonstration halted on the corner of Elm and College Streets, where the marchers faced the graduating class of 2017. Behind a line of police motorcycles, the final group of Local 33’s fasters sat in wheelchairs, in front of a crowd of cheering union supporters and a blue banner that proclaimed, “Just the beginning, Yale.” The protesters cheered on the graduating seniors; some students shouted back words of support. The Local 33 marchers seemed proud and defiant, but in many ways, it wasn’t their day to celebrate. When the formal procession was over, the protesters continued their march to City Hall. There, the eight remaining hunger strikers broke their fast, drinking cups of warm butternut soup. They huddled underneath a white tent as a light drizzle fell on downtown New Haven. They were in good spirits, but weary. In a few days, campus would empty out for the summer. The fight was far from won. The Local 33 marchers seemed proud and defiant, but in many ways, it wasn’t their day to celebrate. Yale, for its part, had already begun its counter-attack. On Commencement Day, volunteers distributed water bottles and palm-sized pamphlets along the procession’s path. The pamphlet, entitled “Information on Graduate Student Unionization,” was a preventative measure. It contained a two-part argument that the graduate student teachers had seen before: one, graduate student teachers at Yale were organizing undemocratically; two, graduate student teachers at Yale were among the most privileged in the country. The material structures that had defined Local 33 during its stint of campus prominence were also quietly removed. At dawn on May 25, a crew of non-union maintenance workers dismantled 33 Wall Street. The following weekend, when alumni descended upon campus for college reunions, no sign of union activity was in sight. The summer’s peace didn’t last long, however. On August 25, as first-years arrived on campus, a curious structure appeared on the New Haven Green. The bowshed was smaller and entirely orange this time, but similarly handsome. 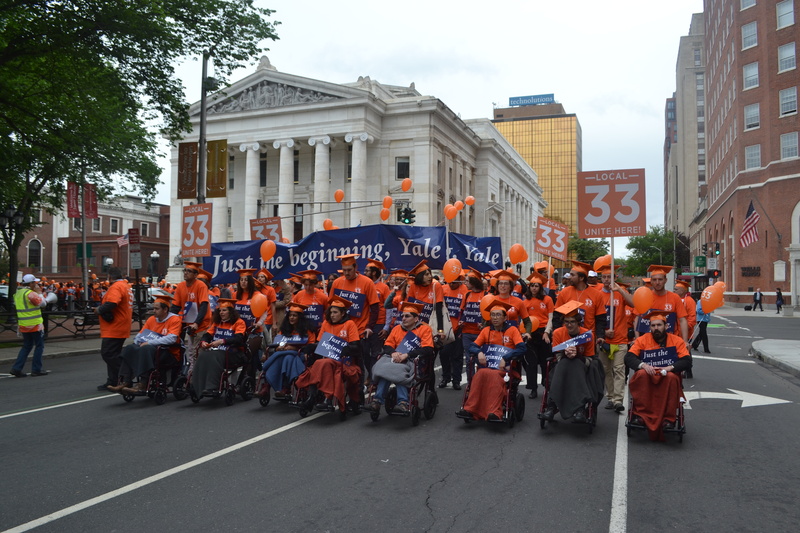 As Yale’s newest class swarmed Old Campus, members of Local 33 stood in front of the cleverly-named “33 College Street,” exchanging smiles and handing out fliers to first-years and their families. In his 1996 article about the history of unionization at Yale, John Wilhelm, then-president of UNITE HERE, reflected on labor struggles new and old. “It’ll take a while, but I think all of us will get over the discouragement and taste a little bit of the joy and the freedom and the power of that kind of struggle,” he said. “Some of us have had the privilege to go through it before.” The legacy of past labor struggles may be hard to shake, but not for a lack of trying.